During his experiments with the electric arc and its application as a high-intense source of light Heinrich Beck always had on his mind the construction of a lamp with higher specific luminance He reached this by a very strong overloading of the carbon poles with wicks of rare earth elements. Then the metal core of the anode evaporated violently and became highly overheated. The technical problems consisted in preventing the arc to spread on the carbon's coat and to guarantee the "Beck-effect" to set in by the constriction of the discharge. These endeavours in his laboratory in Meiningen lead to the invention of the so-called Becksearchlight that Heinrich Beck tested on the roof of the institute. In 1912 the optimal operating conditions were essentially known, so that the technical conversion could be tackled. 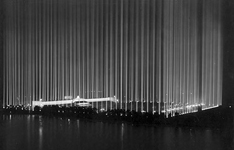 This was done in cooperation with the company Körting & Mathiesen in Leipzig (Extracts from the anniversary catalogue 1939), which already built searchlights since 1909, also produced desk and bedside table lamps with the Bauhaus from 1928 on and still exists as the Kandem Leuchten GmbH iin the Hessian town of Runkel. and approved the grant of a patent for the Becksearchlight. Together with this company the advantages of the new searchlight were presented to the Imperial Navy that showed some interest in the invention but was reluctant to introduce it, because they feared that a purely white light of the Beck Arc couldn´t penetrate a hazy atmosphere as easily as the yellowish light of a usual carbon arc lamp. There were also some reservations about the comparably long and fragile carbons of the Becksearchlight. by the US Navy, on which the German speaking New York State Journal reported very positively on the 18th and 24th of August 1918. With the explicit approval of the German navy administration a test under practical condition was planed on the battleship Texas on July of 1914. Before representatives of the US navy had examined the Becksearchlight on practical demonstrations in Meiningen. In August 1914 Heinrich Beck went to the USA for experimental tests of his searchlight. However it lasted not for long after Heinrich Beck was forced due to the outbreak of the war to remain in the United States that the value of the Becksearchlight rejected before in Germany was now appreciated. Ironically the accumulation of articles in American technical magazines on the so-called "Sperry searchlight", which basically represented a copy of the Becksearchlight that was now manufactured by General Electric contibuted to the recognition of the original in Germany. The first experimental searchlight - still installed on the tower of the laboratory in Meiningen, was thouroghly examined. This model, manufactured by Goerz in 1917, was finally kept by the German Museum in Munich in 1925. In September 1915 there finally was an on-board testing on the S.M.S. Helgoland, when Heinrich Beck was however already forced to live in the United States for one year as a consequence of the First World War. The evaluation of these tests certified that the Becksearchlight reached a high luminous intensity, which was evaluated as a military progress. Soon afterwards, a first series of 100 units were ordered at Körting Mathiesen. Later on bigger numbers followed. The corresponding patents as well as the entire searchlight production in a separate work in Leipzig Leuzsch were taken over by the Optical Institute C. P. Goerz AG. that intensified the development and improved the carbons by inserting in the wick cerium oxide instead of cerium fluoride that was less vaporisable. In the beginning of 1918 the further developed Becksearchlights could yet be used for the defence. 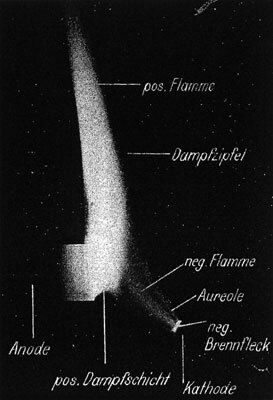 With that 110 cm searchlights a luminous intensity was reached by 537 x 10 6 cd, thus the quadruple compared the pure coal searchlights. Due to corresponding regulations of the Versailles Treaty, which exclusively conceded the rights to manufacture searchlights to the Siemens-Schuckertwerke and the AEG, Goerz terminated the production of Becksearchlights by the end of the war. SSW later on reached a significant increase in performance on the basis of the Becksearchlight. Before the searchlight tests in the USA could be finished, which was reported by the Bridgeport Evening Farmer in August, the news about an impending war in Europe became so urgent that Heinrich Beck decided at short notice to return home on the Belgian steamer Zeeland. But the ship was stopped in the English Channel. All men being able to serve - among them was Heinrich Beck - were interned in Liverpool. After extensive questioning the decision was left up to him to return to the USA, which were still neutral at that time. The return journey began in September after the inventor was even handed out his confiscated documents and plans. In an article of the American Schenectady Gazette this was interpreted as an obvious mistake by the English responsibles, which contributed to the fact that this fundamental technological innovation was finally used by the U.S. Navy. However, according to a measuring protocol from the period after the First World War in the British National Archives in Kew, the projector lamps of Sperry (USA), MCD (GB) and Goerz Beck (D) were compared and their illumination range were shown graphically. So it's quite possible that the British Navy correspondingly benefited from the knowledge of Heinrich Beck's documents. After and his wife returned to the U.S. the British Admiralty offered Heinrich Beck to buy his patents, whose value had been since discovered, for a substantial sum. The German inventor, however, rejected this and successfully managed to get the nanny and his two sons Harald  and Heinz  and to America. Search Lamp with Vapor-Cooled Electrodes in the Electrical World of July 25 1914 described the until then unsurpassed power of the Becksearchlight. 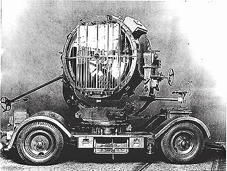 Navy tests in the fall of 1914 showed that the Becksearchlight had a more concentrated beam and an illuminative capacity five times the standard navy searchlight. Because of the war a further cooperation of the American Navy with German companies wasn't thinkable anymore, so a licence treaty was signed between the General Electric Company, Schenectady and Heinrich Beck about the exploitation of his patents. A detailed article appeared in February 1915 in the Knickerbocker Press, in which the German inventor reported on his experiences during of the outbreak of the war. Heinrich Beck stressed the enormous meaning of the new floodlight to ward off hostile torpedo boats. Besides it he assumed that the entire German army was equipped with the new searchlight and that its field-application supported the German march on Paris. GE succeeded with the consultation of the inventor to present an accomplished searchlight construction with the Consulting Engineer of GE, Charles Proteus Steinmetz participating in this development. The Becksearchlight was consequently introduced on all Navy ships. 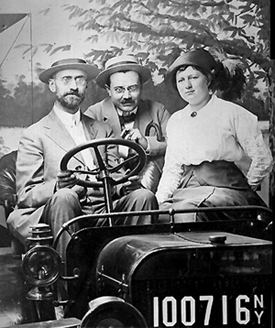 Heinrich Beck settled down in Schenectady, the headquarter of General Electric, with his wife, his two sons and the German nurse. The success of the Becksearchlight also attracted the attention of competitors, which had obtained in secret ways the development documents and experiment samples. Still during the war the Sperry Gyroscope Company came out with a searchlight that was to the smallest details a comprehensive copy of the first experimental Becksearchlight lamp construction. Back in 1914 Elmer A. Sperry had futilely tried to buy the inventor's rights. Sperry had not been willing to pay the 100,000 US Dollars, which Heinrich Beck had required for the sales of his American searchlight patents. Instead he made the counter proposal that the royalties on sales be apportioned among Beck, Sperry and any other whose patent "really afford protection" for the high-intensity light. Sperry was offering him a percentage of the royalties, should he buy the patents, because of Beck's early work in the "general line". However Heinrich Beck had no intention to accept this proposal, since he was sure of the value of his invention and believed it would be fully protected by American patents. Then he had sold these patents for 100.000 dollars to General Electric in addition to 35.000 dollars in commission and expenses. turned to air-cooling and protected this technique by a corresponding US patent. The article in the Electrical World of September 23, 1916 High-Intensity Searchlight for Governmental Purposes reviewed the pretended new invention of Elmer A. Sperry at full length and described it as superior to the development of Heinrich Beck in substantial aspects, which had been presented in this periodical two years before. "(...) My attention has been called to the issue of the 'Electrical World' for Sept. 13, 1916, specifically to an article descriptive to a searchlight credited to Elmer A. Sperry. I have seen such and similar articles (…) with considerable astonishment, since I found myself on very familiar ground, having seen every essential element of the reputed Sperry searchlight several years ago in the searchlight of Heinrich Beck, of which I furnished you data, and which you embodied in an article in the issue of the 'Electrical World' for July 25, 1914. From whatever point of view I look at the so-called Sperry lamp, I am at every turn reminded of the Beck structure, and the Sperry creation appears to me a free and loose aggregation of the elements used in the Beck system. There are features in the Sperry construction, which differ from the Beck lamp, but these do not mark a departure from the Beck system or from the Beck idea; in other words, the so-called Sperry searchlight is still a Beck searchlight. It's only fair to Mr. Beck, for whose advent in the United Stated I am largely responsible, to indicate to the readers of your valuable paper the impression, which the Sperry publications produce on one who is familiar with the subject". "Exploitation is subjected to restrictions. American factory owners have to be licensed, show reports and to effect certain payments. (...) The Federal Trade Commission has fixed the conditions today, which shall be valid under the 'Trading with the Enemy Law' for the exploitation of patents of hostile foreigners in this country. American factory owners can receive licenses for the duration of the patent, not just the duration of the war, but there'll be no exclusive privileges for particular companies. Around 20.000 patents are concerned by this law, of which many are of the greatest value for the American industry. The applicant has to demonstrate that the exploitation of the relevant hostile patent is important for the public welfare, that there is a need, which can't be met and that the applicant is sufficiently equipped to manufacture the relevant article. Licensed factory owners have to hand in half-yearly reports and to make certain payments to the trustee of the hostile property thirteen days later". Should the unauthorized use of the US searchlight patent of Heinrich Beck by Elmer Sperry in 1916 have been at least partially justified according to these aspects by the US government after America's entry into the war in 1917? There are distinct hints in a report of Louis Auerbacher about the searchlight sales negotiations with Sperry Gyroscope, which was conveyed to Heinrich Beck by the chief of the GE-patent department, Joseph Lyons, attached to a letter of June 26, 1917. We visited the factory and were very courteously shown through the entire factory (...) and he (Sperry, note of the author) pointed out the drafting room and he stated that it was ready for Mr. Beck to come in at once and to start his work. He said that every facility would be given Mr. Beck to carry on his work. Mr. Sperry in the various talks he had with myself never intimidated, nor did I hear from anyone else that Mr. Sperry was working on a searchlight of any character whatever. I might add that in my conference with Admiral Griffin, the head of the Steam Engineering, Navy Department, and Lieutenant Commander Sparrow, his Assistant in charge of the Electrical Division at that Bureau, and Lieutenant McDowell, Test Officer of the Navy Yard, it was reiterated time and time again that this invention was to them absolutely new and novel, and that if the tests bore out the claims of the inventor, they were all ready to recommend it to their Department. The outcome of the visit to Mr. Sperry's factory was that Mr. Sperry wished Mr. Beck to submit to him a business proposition whereby he could buy or control his invention, and patents in the United States. There were therefore some negotiations between Mr. Beck and Mr. Sperry, I myself not taking part, as I was ill at the time at my home. The outcome of this was that Mr. Sperry wrote to Mr. Beck, which was undated, which was received by Mr. Beck about November 10, 1914, the receipt of which was acknowledged by Mr. Beck about November 12th.. This Sperry letter outlined the only terms on which he would do business, which terms were rejected by Mr. Beck, which terminated the negotiations. We entirely dismissed Mr. Sperry from our minds and gave him no more thought, as we never for a moment imagined that he contemplated marketing the invention without authority from the inventor, Beck. Meanwhile the test had been going on in the Navy Department and had been completed, and a report was made by Lieutenant McDowell, which was extremely favorable, and later the tests on the battleship 'Texas' were reported on and this also was extremely favorable. The Navy Department officially recommended that this type of lamp be adopted and I had negotiations with the Navy Department in order to enable me to put the lamp on a business basis in this country and to secure the needed facilities to manufacture the lamps so that the Navy could purchase them if they ordered them. On or about the 15th of November, or immediately following the termination of the negotiations with Mr. Sperry I commenced negotiations with the General Electric Company relative to marketing the invention. I had before me the favorable reports and recommendations of the Navy Department and also the fact that they were willing to place orders for these lamps. After negotiating for some weeks a contract was finally made on July 25th (here Mr. Auerbacher is mistaken: the correct date is: january 21 in 1915, annotation of the author), with the General Electric Company whereby they agreed to purchase Mr. Beck's patent under certain terms. Meanwhile the Navy Department had placed an order with us for eight lamps. Some time in January, or February 1915, the Navy Department put out specifications for more lamps of the same type, and we were very much astonished to learn that Mr. Sperry put in a bid under these specifications. We first then became aware of the fact that he had used the knowledge obtained in the negotiations previously had and also the knowledge he had gained in the Navy Yard by examination of the Beck lamp, and that he was preparing to copy Mr. Beck's lamp in order to meet these specifications of the Navy Department, which covered the salient features of this lamp. I therefore tried to find out how it came that Sperry would attempt this and learned that the Secretary of the Navy was very anxious to obtain competition and was advised by some of the officers that it was through the encouragement of the Secretary that Mr. Sperry was prompted to go into the business of trying to duplicate Mr. Beck's invention". Decisive for the agreement out of court between GE and Sperry Gyroscope 1920 - and a hint to Sperry´s actual patent infringement - was the judgement on both sides that a comprehensive patent protection for the respective high intensity searchlight was not available. Therefore a settlement was arranged according to which the Sperry Gyroscope Company had to pay roylaties only for its 150-Ampère searchlights to General Electric because of corresponding patents of Heinrich Beck, whereas their 75-Ampère-projector and studio lamp searchlight as under the agreed upon limit of 100 Ampère were not affected. On his part the representative of Sperry, Thompson, made the counter proposal to General Electric to acquire rights of the improved commercial searchlight that the Sperry Gyroscope was aiming to patent. 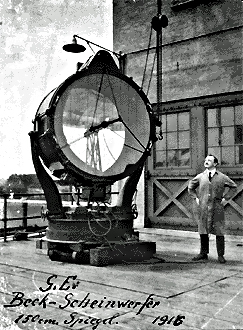 If GE wanted to use the studio lamp searchlight under license, which Sperry Gyroscope had developed and patented, both companies could possibly renounce mutually on demands for royalties, was the assessment of Thompson. In 1915 Sperry had been appointed to the Naval Consulting Board, on which he served until 1929. 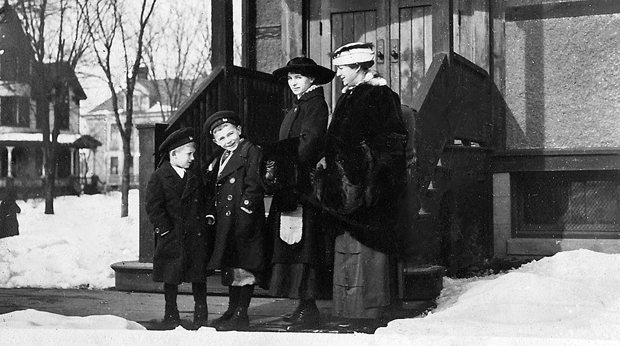 This appointment institutionalised the informal relationship Sperry had established with the Navy before the war. Although Sperry had to acknowledge the priority of the GE/Becksearchlight no demands for royalties could be claimed after the United States entered the war. Heinrich Beck, according to his diary, got in a moral conflict to be involved in war armaments against his home country after the United States declared war to Germany in 1917. Nevertheless there were also regulations in the treaty between him and General Electric that would end his work for GE and all payments by the company in case the USA should get involved in the war. However he and his family were left almost completely undisturbed und was allowed to move freely except of occasional registrations at the police. The German inventor ended his searchlight experiments for General Electric and occupied himself with the invention of military toys in a small cellar workshop, which was probably quite popular during the first world war und for which were also issued some patents. Already in 1912 he had been given a US-patent for a heating apparatus for instruments. 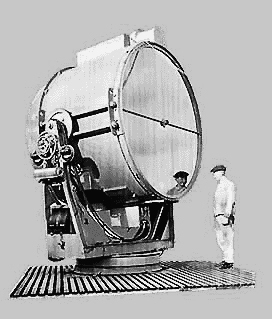 General Electric developed an army searchlight on base of the High Intensity Beckarc Carbon Lamp, which - due to the required mobility - had to be substantially lighter and at the same time more durable than the searchlights used in the navy. for which he would be compensated by a yearly retainer of 2000 Dollars. In addition another agreement was arranged on May 7 in 1921 between the General Electric and Heinrich Beck, in which it was laid down that "the General Electric agrees that it will not sell any searchlights, which involve inventions described in the patents described to herunder to any person, firm or corporation for use by any government, except the United States of America, which was at war with the Empire of Germany within a period of five years prior to the date of such sale". This meant practically in 1921 - three year after the end of the war - still two years of contractual restrictions for General Electric's export of searchlights. In Meiningen he found the property and the laboratory completely rundown. 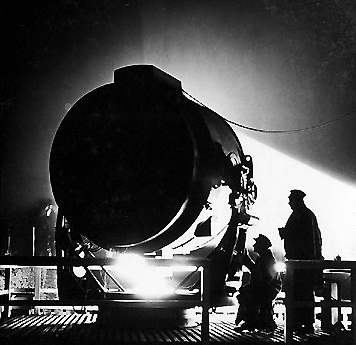 The Versailles Treaty, banning the searchlight production except for Siemens made it impossible for the present to resume work in the traditional research field. He still was in contact with Louis Auerbacher trying to achieve that the US government would give back the Körting searchlight, because he couldn't afford a new one due to the inflation. A second agreement with General Electric of May 7 in 1921 had stipulated that the company should pay the sum of 1500 Dollars as a compensation for testing the searchlight, which Heinrich Beck brought to the United States in 1914 and that should now be returned to him. Quotation: "The said searchlight is now held by the Alien Property Custodian at the works of the General Electric Company at Schenectady, New York, in immediate charge of the Inspector of Engineering Material, (...) and the General Electric agrees that (...) it will, at its own expense, pack the said searchlight for export and place the same at the disposal of Heinrich Beck or his accredited representative". The Becksearchlight could be seen at night flashing over the city. On several measuring stations at different distances the performance of the searchlight was closely analysed. 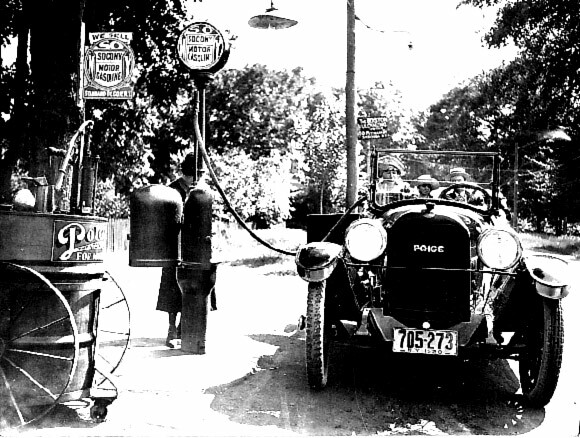 In 1920 a report came out in the Elektrotechnische Zeitschrift with the headline E.T.Z. (1920): Progress in German Searchlight Technology! that described the technical basic work of Heinrich Beck during the development of the Becksearchlight. The author, Dr. G. Gehlhoff, put it clear at the end of his article: "Also the illegal copy of the Becksearchlight, which became known with American ballyhoo as the Sperrysearchlight, couldn't diminish this achievement of German technique." An article was published in the Zeitschrift für technische Physik in the ninth issue of 1921 that was entitled Searchlight Competition of the Prussian War Ministry, in which it was stated that the so-called Sperrysearchlight was in fact just a slightly modified copy of the Becksearchlight: "During the war a searchlight lamp of a far better efficiency was described and shown in the ‚Engineering' of November tenth in 1916 that must have generated at least double the intensity of the usual 110 cm-lamp at 150 Amp. if the published polardiagram was correct. The new construction was identified as a product of the Sperry-Gyroscope-Company and therefore as American. In reality it was the lamp construction of the German engineer H. Beck who went to America before the war for the exploitation of his invention.". Heinrich Beck also published the article Observations on the Development of the Electrical Illumination Technology in the United States for the Hannover special edition of the E.W., in which he treated his own searchlight development and the copy of Elmer A. Sperry as well: "The Becksearchlight represents today the strongest artificial light source that exists; especially when specific surface brightness comes into question. 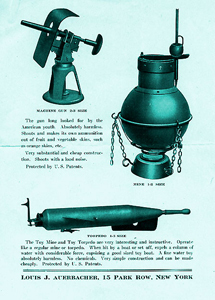 The so-called ‚Sperry´searchlight that entered the market later is nothing but a true copy of the Becksearchlight und offers abolutely nothing new compared to the Becksearchlight.". He also resumed the technical aspects of this legal conflict in a comparison of the two systems in 1924. Heinrich Beck used the time to finish a comprehensive documentation of all the research results gained in the course of all the years that he published under the title Theory of the Beck Arc Light. It remained the only more extensive essay written by him. Development works were slowly resumed and a couple of improvements were conceived and tested as for example the ignition of the light arc by means of a movable third electrode within 0,1 seconds. 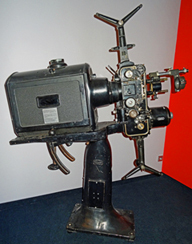 The application of the Beckarc was prepared with the use of the high-intensity arc lamp for the stage and movie illumination and for the cinema projection following the use of high-intensity arc lamps as cinema lamps due to the experiences made with the Becksearchlight of the navy. The biggest advantage was the high-fidelity colour reproduction. In Germany the arc lamp projectors of the Dresden based company Ernemann were highly appreciated that were built between 1936 und 1951. The subsequent time brought new challenges in the field of high-power searchlights for the air defence in which the sons of the inventor, Dr. Harald Beck and Dr. Heinz Beck, along with his assistant, Erich Koch, took part decisively.These searchlights were finally manufactured in great numbers by the Siemens-Schuckertwerke under licence and the AEG. Also this company had worked on new ways of increasing illumination intensity after the publication of the Beck-invention. Thus attempts were also made with highly-overloaded pure carbons, which did not lead to the goal. A coworker of Siemens & Halske, Podszus, tried in 1918 to receive a high brilliance by a constriction of the stream. His patents fell under the Beck patents, also the practical application of the lamp encountered difficulties. In the years 1920/21 Goerz and SSW had agreed on the mutual use of the patents which were placed on the field of the Becker-invention. During this time the Siemens-Schuckertwerke intensified the work on of the Becksearchlight and the lamp construction. In co-operation with the Sipla new carbons were manufactured. The next step was the supply of a 2 m 300 Amp. of searchlight for Greece. With the further increase of the amperage there were problems to receive a calm light arc. This had been already observed by Beck who noted it in his only publication "Theory of the Beck Light Arc", it was about the bifurcation of the negative flame, which was accompanied by a howling tone. 1. Increase of the amperage to at least 1000 Amp. 2. The most even distribution possible of the luminance over the whole crater in order to light up the whole surface with as high a density of light as possible. A completely new way of designing the carbons and the lamps was taken. Dr. Guillery with his co-workers created the physical fundamentals. With the 2 m searchlight model 200/44 and a new lamp for 1000 Amp. a luminous intensity of 4983 x 106 cd was reached. The a 3 m searchlight, whose design was developed during the second half of the Second World War, would have resulted in a luminous intensity of 9967 x 106 cd. With this new lamp one turned from the carbons with a round cross section to a rectangular. In order to reach as even a luminance over the entire crater surface as possible, one tested all-wick carbons, thus carbons with the omission of a coat. The attempts ran unfavourably. Laterally the wick exudes the salts, there were cinders and cracks. The final rectangular coals received a thin coat of only 1/2-1 mm of strength and burned well. The enormous development of the Becksearchlight by the Siemens-Schuckertwerke is reflected very clearly in the values of the following table. For a comparison the earlier values of the pure carbons of the searchlights are also indicated in the last column of the table. These increased outputs of the high intensity searchlights were only made possible through intensive work for many years of the research team and their coworkers in close co-operation with the companies manufacturing the coals Siemens Plania, C Conradty, Dr. Patzelt, Dipl. Ing. Baldewein and Obering. Leuchs. Concerning the measurement of luminous intensity on far distances an indicator for the determination of the light losses in the atmosphere was built by Dr. Guillery and G. Kapp, which worked with a photoelectric cell as a receiver and a comparison source of light worked. The laboratory in Meiningen was integrated in the AEG in 1936 as a research department. Über diese Zeit gibt es bedauerlicherweise keine Dokumente, da ein Großteil des AEG-Archivs am Friedrich-Karl-Ufer in der Mitte Berlins während des Zweiten Weltkriegs zerstört wurde. 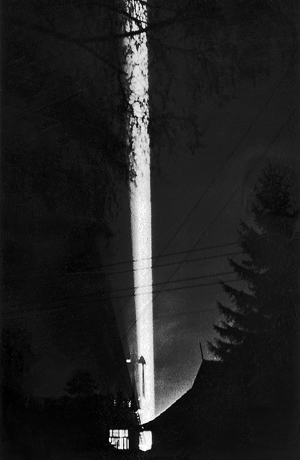 The searchlights of Heinrich Beck were brought to higher outputs in the following time. This is documented by corresponding newspaper articles that described the remarkable brightness of the Becksearchlight and by photographs as the one of the famous "light-dome". After the Second World War Harald Beck continued the searchlight development in a scientific direction (for example in the atmosphere research). Other light arc and plasma applications were added as for example the thermal plasma die-casting of high-melting metals. 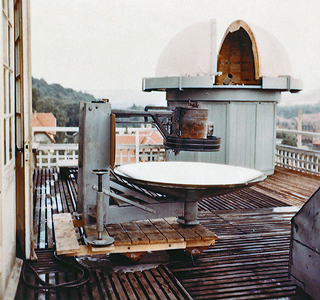 In 1955 the research centre in Meiningen was transformed into an institute of the Academy of Sciences of the GDR and a small observatory was installed on the roof. The Technical University of Ilmenau took over the laboratories in Meiningen in 1968 after Prof. Harald Beck as the founding director of the faculty of light technology had moved to the Federal Republic of Germany in 1962. For more than 20 years until the end of the GDR the scientific team in Meiningen closely examined the physics of technically usable plasmas, mainly focussing on industrial application projects. The achieved results were internationally competitive. From 1960 to 1963, in collaboration with the Institute of Optics and Spectroscopy of the Academy of Sciences of the GDR, Berlin in Berlin-Adlershof in the Department of Atmospheric Optics studies on the atmospheric turbidity stratification performed by brightness were carried by recording the brightness and also temporarily the polarization degree of the vertical headlight beam from the 4 km remote Castle Landsberg.